"No longer serving the 5%"
Our guiding principle here was that the key to an enjoyable AI traffic experience is that it was all about frame rates. What was the point of having real world flight schedules, lots of AFCAD gates and hundreds of additional AI aircraft if the result was crippling frame rates? The primary reason for poor frame rates was the use of aircraft that are quite unsuited for AI use. You can still find these unsuitable aircraft at many flight sim sites as well as at sites dedicated to AI traffic, but fortunately after 3 years, there are a lot more really good AI aircraft models available than there once were. AI Aardvark was committed to providing high quality, frame rate friendly aircraft for use with AI traffic. I T .W A S A L L A B O U T F R A M E R A T E S ! Lets start with the "new" shall we? This is the first all new aia model since 2008. A model no one was asking for, the Canadair CL-215. This model started out life back in October as a weekend challenge to build a CL-215 for use as a static scenery object. That went well, but it looked a little too good. Wonder how hard it would be to make it fly? And now for the "old". 15 years ago today, we released the 727-200. And we're still beating new variations out of it... This time it's the Super 27. We'd never even heard of the Super 27 until about a month ago. Imagine you replaced the 2 fuselage mounted engines on a 727 with the engines and nacelles from a MD-80. That's basically what the Super 27 is. Hey, finally a 727 with thrust reversers you can see in action. While we were at it, we decided to make a hush kit for the standard 727-200. If you like long engine cans and 'slightly' lower noise levels, this is the one for you! To commemorate the 15th anniversary of the very first AI Aardvark releases on December 12, 2002, we're releasing this monster. This release includes repaints for all 4 currently existing Dreamlifters. They're all basically the same, except for some different nose windows, at least one different registration font and the amount of dirt on the swinging tail. We are not releasing a paintkit for this one. The stunts required to fit the fuselage expansion onto the original texture led us to do some things that would not be considered "best practices" in texturing a model. The bulged fuselage is half the size on the texture as the rest of the fuselage which would make doing any repaint that spanned across the original fuselage and the new parts a nightmare to line up. This release is an FS9 model, an FSX version should be along shortly, just as soon as we can find the FSX install discs. P3D? We have no idea what you're talking about. Seriously, what is that, a 3-D game about urination? Wow, we finally got the snow turned off after 2 years! 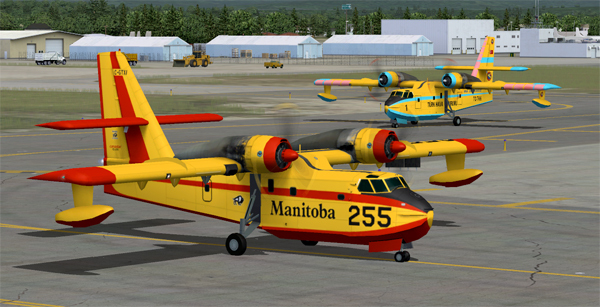 Anyway, there are some FSX versions of a lot of our models that have been uploaded to the usual places. We did lose them. Honest! For Real! What we did find was a gmax file for a 1 LOD model of the 747-400GE, but it was not the final gmax file that the FS9 747's were compiled from. 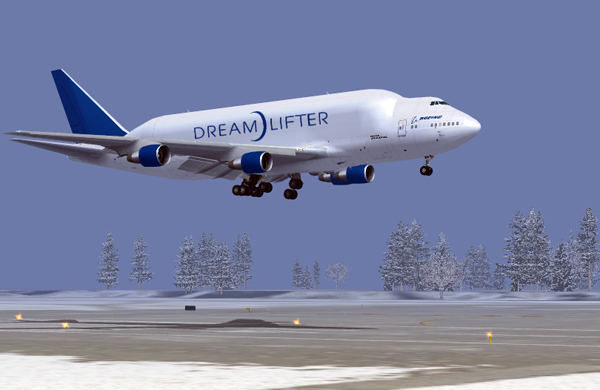 Using that file we rebuilt the LOD's, (only not so many LOD's as before) and then we had a 747-400GE. For the 747-300 we had to build a new wing, since the wings of the -300 and -400 are not the same. Plus some PW engines for it. That gave us the wings and engines we needed to make a 747-200, but we needed to make a new nose section since the -200 doesn't have the extended upper deck. And that's the short version of how we reconstucted the AIA 747 models. So, enjoy the FSX models! Before you pee in your pants, we want to make one thing perfectly clear: this is not a new 767-300 model. 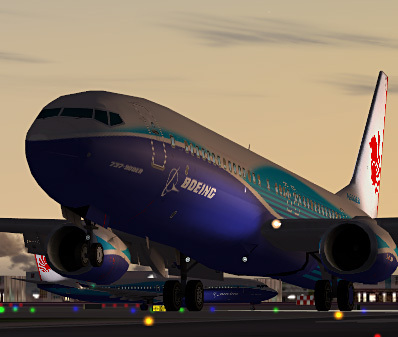 It's the old 767-300 model we released in 2003. Heck, it's not even that, it's actually from a fossilized gmax file that we exhumed and used to make the UT2 767's. This dusty gmax file was not even the one that the original released models were compiled from, it's older than that. It had all the animations, but only 6 LODs, compared to the 10 LODs the released model had. But, since our extensive fps testing has led us to start using a lot less LODs, we didn't have a problem with that. So, what did we do to this relic from FS2002, besides slapping some winglets on it? We changed the shape of the nose, cockpit windows, and APU section. We rebuilt the engines and pylons, added thrust reverser parts and compressing landing gear, and cleaned up that eyesore leading edge wing root. What we did not touch were the wings and flaps or the fuselage blister (we're not masochists). Even though the engines were rebuilt, they were intentionally made to match the shape of the original engines for purposes of paintkit compatibility. Speaking of engines, we only made GE and PW engines because thus far, there are no RR engined 763's with winglets, and we had some important World of Warcraft quests to work on. In addition, a new paintkit was created from almost scratch. We say "almost" because we did recycle some pieces from other paintkits, just because we're so lazy. The wheels and engine fans are all modified textures from the DC-8. If you're a fan blade counter, this model may very well send you into therapy. We've painted all the current users of the 763 winglet, but more keep showing up every couple of months, so eventually, we'll get around to uploading the paintkit for it. Note: You can probably use this new paintkit on the old 767-300 model as well, but we never actually checked that out. (reason? We're lazy, of course...) Using the new paintkit on the old models will not magically endow them with operating thrust reversers though. One last thing, in addition to the usual FS9 model, we've also made a real FSX version of this model as well. So, if you're using FSX, you might want to use the FSX model, because the FSX model is waaaay more fps friendly than the same FS9 model used in FSX. Course, FSX models have some issues, the engine fans don't work, the wheels lock up on landing, and don't even get us started on what happens after dark. These are all "features" of the default FSX models as well though. So, Merry Christmas and Happy New Year from all the usual gang of idiots here at aia. A few people are asking how things will be in the future now that we and some other AI groups have sold our souls to UT2. Will we demand cash for models? Accept PayPal for repaints? The best way to get an idea of what the future might look like is to look to the past. You see, we didn't "sell out" to UT2 last week or even last month. We sold out well over a year and a half ago. So a lot of what you've been seeing released as freeware in that period were models and repaints that were being produced for UT2. All of the models that we created specifically for UT2 we released as freeware long ago. Most of the repaints were released as well. There are a lot of repaints we did that won't be released, because they were painted to use the wrong engine type, or we didn't bother with knocking out windows or painting numbers on the nose gear doors. So, chill out, the freeware sky is not falling. Death of Freeware is Near! Now at last the truth can be told. It was all about the filthy lucre. So, as of today you can now buy what you could only previously get for free. Flight1 has released Ultimate Traffic II, and it's full of aia models. Ok, they're not really the same models. These are FSX models. Which means you'll get FSX goodies such as: self-shadowing, specularity, textures with DX-10, stationary engine fans, and lower framerates. Ok, not all of those are "goodies", but you get the idea. Q: How much will UT2 cost? A: About $400 if we get the compensation deal we asked for. Q: Are you going to pull all of your models from World of AI? A: No, if we were going to do that, we'd have done it before UT2 was released. A: Well, now that you mention it, that still might be a good idea. We'll put it on the agenda for our next Board Meeting/Junket/Boondoggle in Monte Carlo. 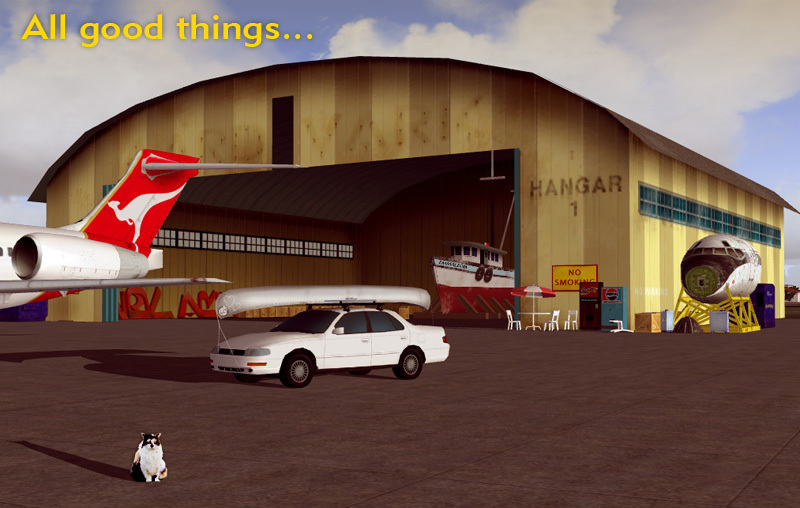 Q: Are you going to release the FSX models as freeware? A: No, we didn't convert them. Flight1 hired someone a lot smarter than any of us are on our best days to figure out how to convert the models to FSX. A: Ok, contact us discreetly and we'll see about getting them to you at $10 a model. Q: How'd you convert the 747's? You guys always said you'd lost the original source files. A: We did lose them. But we dug around really hard in some old emails and found one semi-complete 747-400. It was an earlier version than the one we'd used for the model we originally released, but it seemed close enough. Q: You guys lied about losing the source files didn't you? A: Yeah, it was all part of a really big conspiracy to do something evil, or something like that. Q: Did you find any other "lost" files? Q: When will you release the 747SP? AI Aardvark has been hit by the recent downturn in the economy just like so many other businesses, and today announced a 95% decruiting program aimed at cutting their massive overhead down to a reasonable level. Aardvark's dedicated employees took a further hit when it was discovered that the AIA CEO/COO/CFO had perpetrated an elaborate scam on the dedicated aardvark workforce by convincing them to do an incredible amount of work for a seemingly vaporware project. As the project neared completion, the AIA CEO/COO/CFO simply kept all the money for himself and was last seen heading for South America in a 'borrowed" Fokker 70 jet. To add insult to injury, he even emptied the drink machines as he left the AIA hangar. The single remaining AIA employee, a janitor who sweeps out the mostly empty hangar once a week has announced that he will be appearing before the US Congress next week to request $1.5 billion in bailout money. Most of this money would go towards paying off debts incurred from a failed scheme to market 747's parked out in the desert as deluxe vacation timeshare accomodations. The rest will be used for the acquisition of a new gold-plated G5 to replace the stolen F70. Not a plane that we ever envisioned building, but after being asked last December by someone at World of AI, and with the somewhat vague suggestion that there might be up to $20 (US) in it for us, we just couldn't stop ourselves. So, here come a couple of Fokkers. Want to know why Fokker went bankrupt? Because the F100 has too many bloody variations, different sized passenger doors, different sized baggage doors, and every now and then an extra door behind the wing. Take those 3 variables and then imagine every possible combination. Oh yeah, and 2 different locations for the upper anti-collision beacon. Initially we figured that no one was operating the F100/70 anymore, so repainting would be easy, but we were wrong. Turns out a lot of airlines are still using them. So we've got over 30 repaints and at least half of them we promise won't be KLM Cityhopper variants. Given the recent trend in AI modeling towards higher polycounts and reduced framerates, you've got to be asking yourself what sort of framerate penalty you're going to take if you replace the Fernando Martinez Fokkers with these shiny new ones. Well, we tried our best to make the fps worse than the FM model but we just couldn't manage it without modeling all the seats, meal carts, and coffee pots, so you're just going to have to live with better framerates. How'd we manage that? We did a lot of framerate testing for one thing. And then did everything we could to keep framerate killing things to a minimum, meaning keeping the polycount under control, using as little keyframe animation as possible, keeping reverser parts hidden when not in use (which is 99.9% of the time) and keeping XML to a bare minimum. Our testing showed that all these things take a toll on framerates. Not adding working lavatories helped a lot too. One pleasant spinoff from all this testing is that we're only using 5 LOD models for these Fokkers. We had a 9 LOD model, and for kicks we eliminated every other LOD just to see what would happen. Nothing happened, the framerates stayed the same. Great, huh? So we pushed it and tried a 3 LOD model, but then the framerates took a dive. But 5 LODs made fixing the never ending parade of model bugs a lot simpler. Boeing 757-200 converted into DC-8! The Aardvark engineering staff has been wracking their brains for the past week trying to figure out what to do with the huge number of 757-200's that are suddenly being unceremoniously dumped back onto the AIA tarmac at Aardvark World Headquarters Int'l LLC. And then,in a flash of sheer brilliance, the Way Forward became clear! Convert them into DC-8's! A model that's on the top of everyone's "Most needed AI aircraft model" list for sure. We're nonpartisan in our conversion, so the DC-758, or DC-857 (we haven't settled on an Official Designation yet) features inboard Pratt & Whitney engines, and Rolls Royce engines outboard. And just as we did last year, we're going to reopen the creaky AIA forums for posting for a few days. So come on by and complain about how you really wanted an AirTruk ai model. And it's not even April 1! First off, this is not a new model. This is Craig Crawley's original 757-200 model with winglets slapped on it, plus a few other minor changes. So, if you're looking for thrust reversers and XML flaps, keep on looking, you're not going to find them here. And since this is based on a model from 2003, it has some pretty archaic "features", like only one wing texture, and the inboard engine nacelle texture is shared by both engines. And some odd double-sided polygons. But despite showing it's age in some areas, this is still a pretty good model. The one thing that really made the original model look not-so-good in 2008 was the use of a 2003 paintkit. So, we fixed that. Almost all of the base textures for the fuselage and tail have been remade from scratch. That means new windows, and new fuselage lines, plus some other details, which make this model look a lot better. With this release, we'd like to introduce a new Independent Contractor Painter to AIA, John Massey. John painted the United Airlines repaint shown above. Welcome to the AIA FunHouse, John! Didn't you guys lose the source file for the 757? Craig Crawley, who modeled the AIA 757 did lose all his gmax files (not just the 757) in a hard drive disaster several years ago. Which is what we've been telling people for years. And it was true. However, a few months ago while clearing out the AIA hangar to make room for a larger aircraft, David Rawlins discovered that he had a very old gmax file for the 757-200 which he had gotten from Craig in 2003. That didn't clear the way for adding winglets to the model though, there were a couple of problems, first of which is, David R doesn't know how to model in gmax, he can barely model a cube within gmax. Second, the gmax file that was found was for the "original" AIA 757-200 model. At some point after the release, Craig had re-issued the 757-200 with re-worked cockpit windows that were more accurate. The gmax file we found was not of this re-worked model. After some trial and error, we found a way to get the model out of gmax and into David R's modeling program, Lightwave. The export out of gmax isn't perfect though, it has a bad habit of shifting all the vertices around. This happens to models being exported to FS as well, but the shifts are so small that you don't notice. However, for this project, that meant a bit of work when the LW modeled winglets were imported into gmax and they didn't quite line up with the gmax wing tips. So, a little microsurgery was performed and the winglets were successfully welded onto the original wingtips. That left the cockpit windows to deal with though. The entire nose section was remodeled in LW and then imported into gmax where more micro-welding attached it to the original gmax fuselage. Because of the remodeled windows, the paintkit changed a bit for the winglet model, so trying to use old textures on the winglet model is not a good idea, nor is trying to use a winglet texture on an older non-winglet model recommended. There were other issues that we thought about dealing with, like the awkwardly modeled fuselage/wing blister, but that looked like a lot of work for something that was hard to see once painted. That sort of thing was starting down the road to building an all new 757 model. However, we did add compressing gear, since that was an easy thing to do. Despite the added polygons from the winglets, the framerates for this model are the same as for the older winglet model. 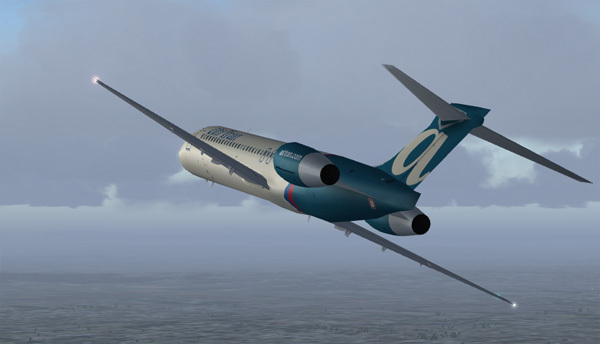 And despite the 757 having only 5 LOD models, this model still has slightly better FPS than the aia 733v2 model. Though of course, the 757w model isn't weighed down with the extra baggage of thrust reversers or XML flaps either. Ok, enough talk about esoteric modeling techniques, enjoy the 757 winglet model, and have a fun Easter. Limited Edition AI Aardvark Easter Eggs are now available at avsim. Available in 3 happy colors. AIA is not responsible for damage to your FS sensibilities if you actually install these in FS. 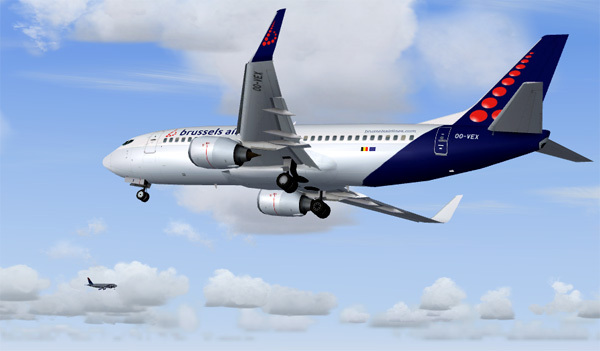 The EMB190 and EMB195 base models have been re-uploaded to avsim. These are the same models that were uploaded a week ago, they contain no additional bugs for your FS enjoyment. They were re-uploaded because avsim got confused and renamed the files with exciting names like "aiemb190_230058.zip", instead of "aiemb190.zip". And of course, most repaint descriptions call for the original model names. Avsim said they could not re-name the files already in their library, so the only solution seemed to be to re-upload the very same files again and cross our fingers. So, if you have already downloaded the updated "B" models, you do not need to download these same "B" models again when you see them appear in the avsim library. Unless you just like collecting .zip files. It was pointed out that the EMB190/195 we released in December was a little thin in the belly area, so after a steady diet of Christmas cookies and crushed modelers we think it's now fat enough now to re-release. Some people will probably complain that it's still not bulbous enough, but we're really tired of seeing this model and are ready to be done with it. Besides, it's only the third AI EMB190 to come along, so surely there will be another that can build on the too-numerous-to-mention short comings of our model and produce the ultimate EMB190/195 for AI use. Just to keep ourselves slightly less confused, we refer to these new models as "B" models. That's not an Embraer classification, it's a classification totally of our own making. So, "B" as in Belly, or Bogus, take your pick. Because of the changes made to the belly and fuselage, new paintkits are being released as well, and the "B" models won't work with the originally released textures. "B" textures are already made for most of the original repaints we released, and the rest should be available within a week. The author of the one 3rd party repaint that was done for the EMB190 has been contacted and informed about the changes needed to work on the "B" model. And Santa's got a bag full of new toys for good little girls and boys. And for the naughty one's he's got this lump of coal, in the form of a "How to make a lightmap" tutorial. Enough with the coal, what's in the bag? After years of delays and a stupifying lack of interest by almost all involved, the aia EMB-190 finally rolls out of the hangar. What we once thought was going to be a simple stretch of the original EMB-170 model turned out to be anything but simple. Besides the obvious fuselage stretching, the actual EMB-190 has larger engines, a wider wingspan, wider stabilizers and heavier main landing gear. Which meant we had to practically build a new model. The only parts that are essentially unchanged from the EMB-170 model are the nose wheel and vertical stabilizer. Even the fuselage shape got refined from the original 170 model. 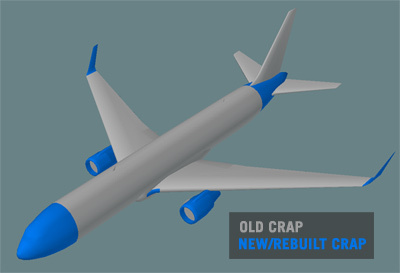 All those new parts meant that there was very little that could be recycled from the original 170 paintkit except for a few fuselage details. We even made new windows. And then we added stuff the old models never had, like compressing landing gear, XML flaps on takeoff, and thrust reversers. The usual gang of idiots and slackers did their usual wonderful job of making repaints for these models, which we're too lazy to look up and list here, but trust us, it's a lot. Fruttal Battissimo, Tony Fosler, David Freed, Boris Le Veve, Federico Permutti, Chris Reuter, Heiko Schmidt, Denis Schranz, Robert Smith, Arnaud Solvay, Jakob Tischler, Phillip Tan, Steve Tran & Ralf Winkler. Same as above, just 2 meters longer. An interesting thing we noticed while making profile images of the 195, is that it is actually longer than a Boeing 737-400. Feel the need to paint the Embraer house colors on these new models? Here's your chance to ignore all those annoying relatives in your home next week. We'd almost forgotten about these until we got an email from South America this week (True story. And that's the only email or PM we've ever received about the 737-400/500v2 paintkits) looking for the 737-500v2 paintkit. So, we sent scouts into the dark and dusty aia hangar looking for the paintkits. After 2 days and several close encounters with killer pigeons, we found them behind a crate of old dc-8 "No Smoking" signs (look for them on ebay next week). As often happens when building and releasing a series of aircraft that are the same except for fuselage lengths, the last one in a series to be released has a much better paintkit than the first model to be released. So, as we worked on the 737-400 model, we made paintkit changes and also updated the in-house 737-300 paintkit while we worked. Then when working on the 737-500, we found more things that could be changed, so we also kept updating both the 737-400 and 737-300 paintkits everytime we made a change to the 737-500. So, the 737-400v2 and 737-500v2 paintkits are new, and the 737-300v2 paintkit is replacing the original one we uploaded months ago. New models for ALL of the AIA 737NG series! New Vertical Tail to replace the old Fat One! Of course, all these goodies don't come free. Expect a slight FPS loss with these new models. In our test set up, the original 737-900ER model was getting 24.4 fps, the new one, 23.5 fps. Half of that fps hit is because of the added XML. The other half from the added poly load. These new SuperDupers do not need new textures, they work with the same textures that you're currently using on the original aia NG models. 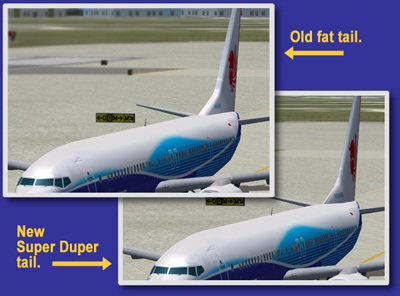 The more perceptive of you reading this may wonder how we added thrust reversers since there was no thrust reverser texture on the original NG textures. Well, as you would expect from us, we cheated. We just mapped the thrust reverser interior parts to several darkish sections of the paintkit that no one doing a normal repaint would ever touch. We made SD models of all the 737NG's we've ever released, and even one that doesn't currently exist: A 737-600 with winglets. Everyone here at AI Aardvark (closed ) would like to wish a Merry Christmas and/or Happy Holidays to everyone who's managed to read all the way down here to the bottom of this post. Yes indeed, it's time to replace that trusty workhorse of AI models, the aia 737-300 that was released in December 2002. And it's about time too. While the aia 737-300 was state of the art in 2002, it's starting to show it's age and even a fresh coat of paint can't hide it's many flaws. In 2006 there was a plan to do a quick and dirty update of the 737-300 that involved spot welding the better looking 737NG nose onto the original model, adding a few extra LOD models and then kicking it out of the hangar before finally closing the doors for good. For various reasons, mostly to do with lack of time, that just never happened. But the idea just wouldn't go away. So, shortly after the release of the 737-900ER, we gathered together a lot of the old aia group, (who for some reason are all involved with the marketing of produce now), and started on an update of the original 737-300 model. All the slacker plans for updating the model just weren't working, so we bit the bullet and ended up practically building a brand new 737-300 from the ground up. New wings, new engines, new tail surfaces, new textures, even some new features. First the bad news, this model will not work with repaints made for the original aia 737-300 model. However, this Version 2 model is being released with many repaints, way too many in fact. This unfortunate situation is the result of having too many repainters, and delaying the release of this model not once, but twice because of real world commitments. Unfortunately the painters didn't take a vacation as was hoped, but kept making more repaints. These painters have been severely reprimanded. 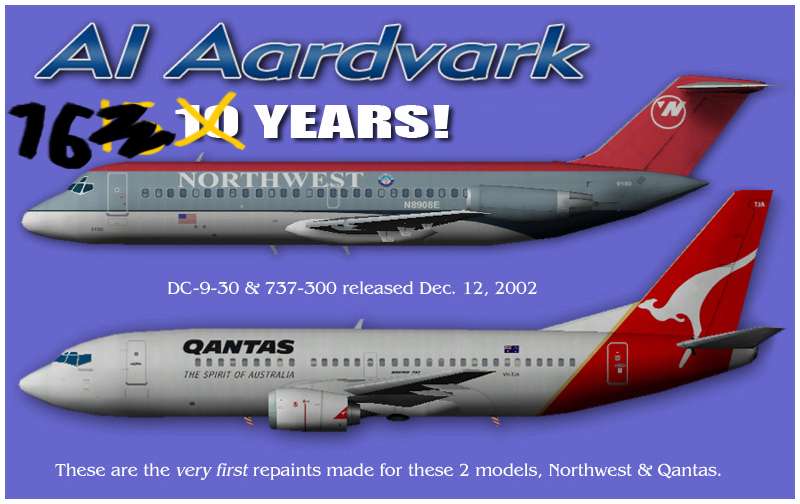 Ok, so now you've got to replace all your 737-300 repaints, what are you getting in return? Better framerates, that's what. And we're not talking about an incremental improvement, we're talking big time improvements. In our test setup where the old 737-300 model was delivering 10 fps, this new model is delivering 23 fps! So, better framerates, too many repaints, anything else worth mentioning about this new model? Well, how about thrust reversers! AIA always resisted adding these polygon heavy monsters to the 737s, but we finally gave up and added them. In addition, this new model has compressing landing gear, as well as XML flaps coded by Boback Shahsafdari. Ok, so improved framerates, an annoying number of new repaints, thrust reversers, XML flaps and compressing gear, anything else? Yeah, one other thing worth mentioning. Winglets! Any email messages asking about a possible 737-400/500 based on this v2 model will be gleefuly ignored. There's so much information about the history and features of this model, that we just don't have room to post it all here. If you want more information, check out this new page. There are persistant rumors that this model has been available since last summer. We haven't been able to verify this, but if true, these are unauthorized models illegally distributed by unscrupulous individuals that we would purge from our ranks if only we could figure out who they are. With a model as poorly made as the 737-300v2, you'd expect that it would be chock full of bugs, and boy would you be right! Leading edge of left wing has visible seam between engine pylon and fuselage. Normal model has trailing white nav wingtip light too far behind wing. Eyebrow windows still show up on fuselage if painted to represent plugged eyebrow windows. The 737-900ER base model, paintkit and one lonely repaint have been uploaded to Avsim and Flightsim.com. If you're thinking this is just the old AIA 737-900 model, jazzed up with winglets and a couple of extra exit doors, well, you'd be right. If you're looking for fancy new-fangled features like compressing landing gear and XML controlled flaps, don't download this model for you'll be sorely disappointed. The prototype repaint in the Boeing/Lion Airlines scheme was painted by Arnaud Solvay, who has become quite the painting machine the past few weeks, having just finished a truckload of 777 repaints. Arnaud Solvay, David Freed, Federico Permutti, Ralf Winkler, Chris Reuter, Tony Fosler, Denis Schranz & Boris Le Veve. You may be wondering how you might report the inevitable problems you might find with the 737-900ER given AIA's aversion to reading emails. Well, for a limited time only (10 days) we're re-opening the public section of the AIA forum. Not the whole forum actually, just one forum that you can post in. So, come on in, and say hello and possibly find out what some of those crafty aardvarks have been up to for the past year. In addition to complaining about the 737-900ER, of course. After months of apparent silence from the Aardvark hangar, which led many people to believe that the aardvarks had given up on model building and were spending all their time eating pizza, watching tv and improving their hand-eye coordination with PlayStation, the final model of the MD-80 series is finally rolled out, the Boeing 717-200. The main reason for the long wait after the md-90 is that the 717 is not just a "simple fuselage stretch and slap on some new engines" conversion. It is all that of course, but in addition, there is a new wing, and a reworked fuselage to fit with that new wing. World of AI introduced the 717 model a few days ago with their AirTran package featuring 4 AirTran 717 variations painted by Tony Fosler. This model also features something we think is new in the AI world, flaps that are used for takeoff. Most real world aircraft use flaps on takeoff, but not AI aircraft which only use them for landings. 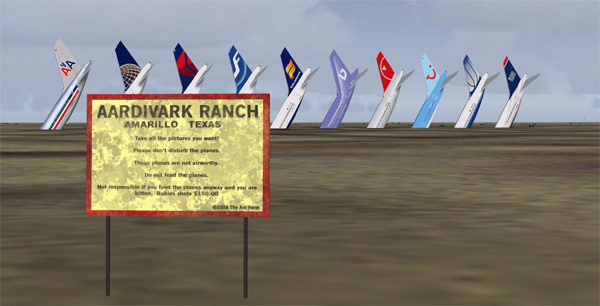 Not any more, the AIA 717 will use approximately 10 degrees of flaps on takeoff, and will retract them at 2000 ft.
Look for the 717 at Avsim and Flightsim.com, along with repaints by Boback Shahsafdari, Federico Permutti, Phillip Tan, Kaveh Payandeh, Steve Tran and Tony Fosler. As of April 1, 2006, David Rawlins is retiring from AI modeling. When Craig Crawley and myself started AI Aardvark in December 2002 we were excited about setting out on a new venture, and it's been a lot of fun, and we've made some dear friends along the way. But, neither of us ever anticipated the huge amounts of time that would be required to build new models and make paintkits. And as time went on and the quality of our models and repaints improved, it took even more time to produce a finished model. Craig effectively dropped out of AI modeling well over a year ago, and today, I am doing the same. This decision was not arrived at lightly, nor in haste. In fact, I made the decision that I was going to call it quits in June 2005. But, there were some models I wanted to finish, and I've always believed it's better to finish on your own terms, rather than linger for months doing nothing before finally announcing that it was time to close up shop. And even back in June of last year, I knew the exact date I wanted to announce my decision, April 1. And now that time has arrived. I'm not leaving the 3d modeling world, but I need to learn more on the animation end of things, and I've about milked all the knowledge I can out of AI model building, so it's time to move on to something that's more useful in the real world. Next week, I start learning Maya. David Carter: The first person who contacted me in the fall of 2002 about an ai 727 model I had made. David lives in Australia and has been a steady mind to discuss the ins and outs of FDE's as well as keeping us on plot when we were in danger of drifting off. He also has an encyclopedic knowledge of aviation. 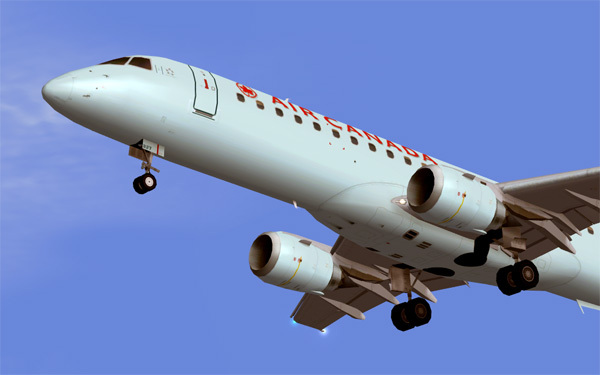 Craig Crawley: Craig came to 3d modeling with no experience, and over the course of 2 months, and about 30 dc-9 fuselages, made one of the first AIA models, the dc-9-30. Craig changed the AI world with his 747's, in their many variations and seemingly endless number of engine types. Boback Shahsafdari: Boback joined Aardvark shortly after we started, and is known throughout the FS world for his meticulous repaints and no-nonsense way of dealing with things. Daniel DiBacco: Danno was also an incredible painter, but mysteriously dropped out of sight a few years ago, and except for a few brief contacts has vanished from the FS world. Peter Pavlin: Peter is an amazing painter, and created the 747-400 paintkit for Craig's model, raising the bar for AI paintkits. In fact, Peter's paintkit was used to make repaints that look better than many UI repaints. Peter also developed a utility that we use to this day to add specularity to models without the need for tedious and time consuming text editing. Peter has not been active with AI for many months now. In addition to these guys, we also had gathered together quite a group of beta testers and what we called "Independent Contractor" repainters. Beta Testers: Chris Reuter, Ralf Winkler, David Freed, Arnaud Solvay, Mark Lupus, Tony Fosler. Painters: Phillip Tan, Steve Tran, Federico Permutti, Alexis Solvay, Denis Schranz, Kaveh Payandeh, Tony Fosler. These people have made a major contribution to the quaility of AIA models. What's going to happen to AIA now? Well, we had lots of discussions about this, and the consensus is that without an active modeler, AIA has no reason to continue. Rather than flail around for months, pretending that various people are going to take up modeling, we all agree that the right thing to do is to close up shop. So, in a few weeks we will be shutting the forums down. For the immediate future, the website and forums will still be viewable as a resource for people looking for information, but there will be no more posting. The repaints pages will also not be updated after today. There's no need to despair though, the AI world right now is in very good shape. In particular, Evolve AI is producing models that are certainly as good as any model AIA has produced, and a heck of a lot better than some of our more "vintage" models. And so, I leave AIA now. In addition to learning more 3d stuff in the future, I may even have time to actually fly in FS now... 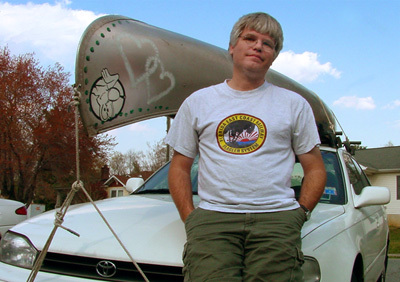 I also plan on spending more time in my canoe, away from humming computers and glowing screens.